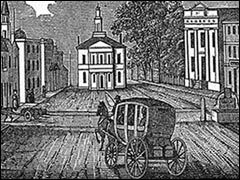 The purpose of this section of the Website is to present some buildings in Salem, primarily ones that existed in Hawthorne's time, and in many cases are still standing. Most of these buildings have specific connections with Hawthorne, but a few contemporary buildings are included to provide a sense of Salem today. The subtopics in this section are: Government Buildings; Commercial Buildings; Churches; Museums, Libraries, and Schools; Other Buildings. Essex County Courthouses, 32-36-42 Federal St.
Brown Building (Merchant's Building; Union Building) , 2-4 Union St. and 105-107 Essex St.
Bowker (Manning) Block, 144-156 Essex St. Mall at Liberty St.
Peabody Building, 120-128 Washington St.
Lawrence Place, 133 and 137 Washington Street and 34 Front St.
Salem City Hall, 93 Washington St. Branch Church on Howard St.
St. Mary's Church, Mall and Bridge St.
Roman Catholic Church, corner of Mall and Forrester Sts. Salem Athenaeum, 337 Essex St.
Hamilton Hall 9 Chestnut St. at Cambridge St.
Old Town Hall and Market, Derby Square, 32 Derby Square between Essex Street Mall and Front St.